Problem and incident management are fundamental processes within any service management organization. This session will cover aligning ITIL best practices with problem and incident management implementations to meet quality, cost and other critical service metrics. The real value however is in leveraging a holistic approach to IT service levels, integrating problem and incident management with other IT functions in the IT lifecycle, including IT Asset Management, IT Financial Management and IT Project Management. By tracking and managing problems and incidents across the IT lifecycle, organizations can truly track and measure the real benefits, costs and return on investment of their service management initiatives. In this panel discussion, industry experts will discuss service design and behaviours involved. Speakers will explain the user experience and how this can be addressed during service design as well as managing and changing behaviour of users, customers and IT professionals to optimise the e2e service experience. They will also discuss how can movements like Agile, Lean and DevOps support this changing mindset for better service design? Designing service management processes is a fear that must be overcome as the business now expects change as it begins to reshape itself in this new age of IT. These expectations need a pragmatic response, not fantastic, and all they need to reveal is an IT organization capable of re-engineering itself while maintaining control. Design should deliver a new experience, new interfaces and with the minimum of fuss and overhead. Tune-in to this presentation and learn what you need to overcome the fear of process design, how wizards, widgets and a codeless design environment gives you the advantage you need to realistically deliver to the expectations wanted by the business. This presentation will put ITIL in its rightful place as the framework around which IT will ensure the control elements within their strategy remain managed and secure. Increasingly forward-thinking IT organisations know they need to become the services broker as the business, end-users, customers and suppliers demand a different experience of IT, where these stakeholders are looking to exploit every technology advantage available to them; whether for commercial gain or smarter working. One thing is for sure, anyone submitting an IT strategy as part of a 3 or 5 year business plan, where ITIL remains the dominant best practice and no collaboration exists across the wider business, will be out-of-date and based upon hope. IT organisations spend most of their time and effort working on short term needs. This webinar will help you to think about how you can take a more strategic approach to delivery of IT to your customers. Where are you and will you be ready for the business and customer needs of tomorrow? Attend this unique presentation and gain insight into the next chapter of IT’s role in the organisation. The next 5 years are going to be a great time for IT leaders who see the opportunity. Service Catalog, Service Stores, Mobile Apps, Social, Big Data are all here today, but the 8 states of IT is going to radically change IT and turn us into a Tri-Modal Organization. Core, Apps and You. Is this really a great time for IT and why? The 8 States of IT – Where are you today? Too busy to innovate? Spending too much time 'keeping the lights on'? As the world of IT continues to evolve rapidly, how do we strike a better bimodal balance? Join the panel of Andy White, Tony Probert, and Greg Sanker as we explore how effective IT Service Management leverages the knowledge and technology you already have in creativity and innovative ways to increase business value. This interactive discussion will address your questions about the future of IT roles, technology, innovation, and how IT can demonstrate value. Continual Service Improvement is all about getting better at everything you do. As you develop, implement and maintain your services, processes and functions, CSI is there to offer support and improvement along the way. In this webinar you will learn the steps you can take to help your organization realign services to improve overall service delivery. Andy White, EVP and General Manager of EasyVista talks about the "bowtie effect" where IT is the "broker of services" between tech and customer demands. Learn how progressive IT organisations have responded to end-users and customers that demand more from IT. These organisations have delivered a familiar consumerised experience and are delivering services through an IT Store and more. Wizards and widgets are used in a codeless design environment to deliver services as apps – Service catalog, stylised business value dashboards and more. The rebirth of the User Interface will be the catalyst through which IT finally bridge the gap with the business; Services delivered will optimise budgets and maximise output and performance. The services delivered will be used by a workflow that is increasingly mobile, the presentation layer (or user interface) will encourage acceptance and in turn the services delivered will drive productivity. You're Invited: Meet SUI - the new Service User Interface! The “consumerization of IT” is upon us. Technology has caused a natural paradigm shift that is blurring the boundaries between business and private lives. Fear about security breaches is no longer justification for enforcing rigid technology barriers. IT is being forced to implement policies in order to guide employees while still allowing them the freedom to be creative. Are you ready to shift into a new paradigm of IT? Join Benoit Tessier, the Leader of IT Service Management at Domtar, as he discusses their journey to create a collaborative, efficient and responsive environment to support the demands of their progressive and mobile community. Are you tired of reactive service management? Join this webinar to find out how to begin the journey toward proactive service management with process integration. Senior IT executives are being held accountable to better manage the quality and reliability of IT under the pressures of increasing customer demands, technology expansion and regulatory requirements. Standards, such as ITIL, play a very useful role, but do you find yourself asking questions about how to make ITIL successful and sustainable for your organization? Join ITIL Expert and ISO/IEC 20000 Manager certified, Russell Stopek, as he shares his knowledge, insight and experience to help clarify the confusion behind the ITIL framework. Russell will help you understand the ITIL framework and guide you to the right ITIL approach to avoid wasted effort. Leave this webinar with an understanding of ITIL implementation best practices and how you can best apply ITIL processes to your organization, avoiding common pitfalls. Driven by technology advancements, industry best practices and customer demands, the ever-changing technology landscape make the IT infrastructure increasingly complex to manage. Configuration Management removes the guess work from IT decision making. Without a configuration management database the implication of change is unknown. If you don’t know what your information technology assets are and how they are related to one another, how can you manage, improve and support them? 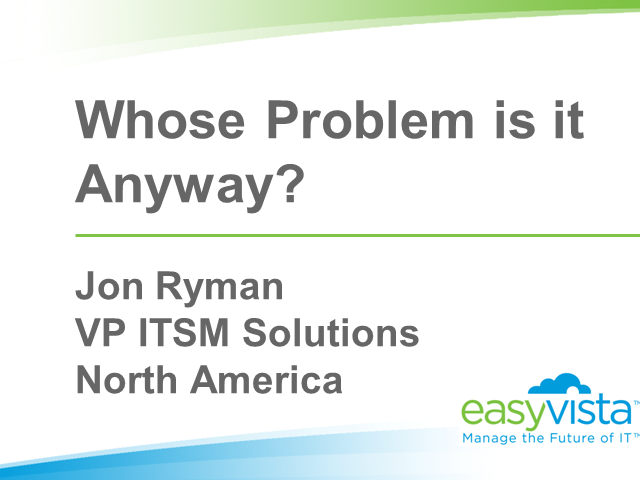 Attend this webinar to find out how EasyVista’s Configuration Management can help you make informed decisions regarding your IT infrastructure. Running your IT organization shouldn’t require guesswork. Informed IT decision-making begins with clean and accurate data. Usable data coupled with reporting, analytics and true business intelligence technology provides the flexibility to explore, manipulate, simulate and analyze trends and patterns, identifying potential risks and liabilities. Join EasyVista and explore how definitive decision-making based on intelligent data will help you streamline operations, improve efficiencies, increase profitability and continually improve your service delivery. Cloud consumers are becoming savvier by the day, and it’s not just about cost savings anymore. SaaS is about so much more than the basics, it’s about rapid deployment, agility, data privacy, it’s about secure integrations, and it’s about the SERVICE. Whether you need out-of-the- box KPI dashboards and monitoring, true Business Intelligence for simulation and multi-dimension analysis, the ability to benchmark your efficiencies against industry standards or integration with ERP systems like SAP or other mission critical applications, this webinar will discuss the key considerations when evaluating ITSM cloud vendors. Are you facing support and maintenance challenges with your legacy helpdesk tool? The rapid evolution of technology coupled with poor service delivery from your current vendor, an expired maintenance contract, a retired solution, expensive and resource intensive upgrades or not seeing your current vendors vision for the future means that it might be time for a change. Stop worrying about your embarrassingly dated or complex solution and focus on your future IT success. Attend this webinar to learn about the latest IT Service Management trends and what you can do to offer more cost effective, reliable and focused service delivery. The “impersonal” world of self-service has taken over. It has become the preferred method of interaction. At the very minimum an organization must provide equivalent service across all touch-points – telephone, email and web self-service. In fact, it has gone one step further to a demand for cross-touchpoint service. The IT organization must move from a multi-channel approach to an agile approach – regardless of where the request begins, it may finish in another channel. EasyVista, a leading provider of IT Service and Asset Management software, has more than 25 years of experience as a pure player in the IT Management space. The company has a direct presence around the world with offices in the US, Canada, France, Germany, UK, Italy, Spain and Portugal. EasyVista is quoted on NYSE Alternext exchange (ALEZV). Title: Whose Problem is it Anyway?